England wicketkeeper Matt Prior has been reprimanded by the International Cricket Council after smashing a window in the second Test against Sri Lanka. Prior was run out for four on the final day at Lord's and when he returned to the dressing-room his bat fell against the window, shattering the glass. A female spectator in the members' enclosure directly below the window suffered a small cut on her ankle. 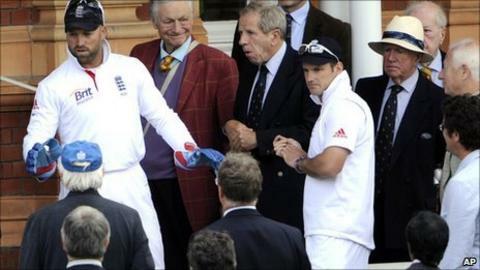 Prior, accompanied by captain Andrew Strauss, later apologised in person. According to an ICC statement, Prior was found to have breached clause 2.1.2 of the ICC code of conduct which relates to abuse of cricket equipment or clothing, ground equipment or fixtures and fittings during an international match. The Sussex star could have been fined 50% of his match fee for the offence, but was let off with a warning after he accepted the charge. "Matt knows that his action was in breach of the code and he should be more careful in future," said match referee Javagal Srinath. "That said, it was clear that the damage he caused was purely accidental and without malice. It's also noted that he apologised to the ground authority for the incident." Strauss, speaking after the match was drawn, commented: "It was one of those unfortunate incidents. Matt didn't mean to break the window at all. "He holds all his bats against the wall and he put it there and it bounced off the other bat and hit the window. It was important that he apologised to the people below because it could have been dangerous. Hopefully it won't happen again. "We are always annoyed when we get out, especially run out, but that wasn't why the window got broken." England team spokesman James Avery originally said the glass had been broken after Prior's gloves ricocheted off a kit bag and knocked the bats, resting on the window pane. But he later issued a second statement, contradicting the first. Avery said he was at first working from second-hand information, but had learned the true sequence of events from coach Andy Flower, who witnessed the incident. The 29-year-old Prior had been dismissed as England chased quick runs before a declaration on the final day. England left themselves 58 overs to bowl out Sri Lanka but could only take three wickets on a flat wicket. England lead the series 1-0 with one Test to play. That begins at The Rose Bowl in Hampshire on Thursday, 16 June. "We thought we had a chance if we took early wickets," said Strauss. "We knew the wicket on the fifth day at Lord's would be flat so we needed something special to happen. "It died a bit of a death which is a shame. There are a lot of positives to take out. It was not the best Test match we have ever played but we move on to the Rose Bowl in good spirits." England could face a tricky selection dilemma should attack leader James Anderson recover from injury. Steven Finn, who took four wickets in the first innings at Lord's, and Stuart Broad are both vulnerable. Strauss, though, was giving little away. He said: "Hopefully Jimmy will be fit but we don't know at this stage." The captain scored only four runs over two innings in the match as he tries to bat his way out of some sticky form, but he was unconcerned, adding: "It's the nature of the beast to an extent but I'll see what I can do at Rose Bowl." He was, however, impressed with Kevin Pietersen after the right-hander had hit 72 having begun the match under pressure to make a big score. "It was not an easy situation when he went out to bat under the flood lights with dark cloud cover and he grafted well. But he came out the other side and played really well today. Hopefully this can be the catalyst for a purple patch like the one Alastair Cook is having." As for the bowlers, who struggled in the early stages of Sri Lanka's first innings, Strauss admitted: "There was a lack of consistency there and consistency is something we have prided ourselves on. "But the guys are not machines. Sometimes the rhythm is not there and it's hard work. The most important thing is we don't make the same mistake twice."